John Milloy, A National Crime: The Canadian Government and the Residential School System – 1879 to 1986. Winnipeg: University of Manitoba Press, 1999. 462 pages, ISBN 0-88755646-9, $24.95 paperback, $55.00 cloth. For over a century thousands of Aboriginal students were forced to attend government-sponsored, church-run residential schools, where, it was believed, they could be acculturated into the dominant Canadian society. John Milloy’s A National Crime is the latest in a number of recently published books which explore this neglected aspect of Canadian history. The story that he tells is tragic from almost every angle. Established with the purpose of assisting in the assimilation of Aboriginal people into Canadian society, the residential school system was seen as the most efficient means of replacing traditional Aboriginal values and practices with Eurocentric ones. Thus, it seemed logical to take the children away from the “bad” influence of their parents and community and place them in a “civilized, Christian setting.” In reality, the residential school system was consistently underfunded and often poorly managed. School buildings were badly constructed, and students were often poorly fed and housed in overcrowded quarters. Disease and death became a common feature of the residential school system during the early part of the century. Reports by medical doctors concerning the horrific health conditions under which the students lived and died were ignored by government officials and the public alike. Physical, emotional and sexual abuse remained constant until the schools were finally abandoned in the 1980s. By then, both government and clerical authorities were willing to admit that the grand experiment had failed, and that Aboriginal Canadians should be allowed local control of their own education. Milloy’s book is an outgrowth of his research on the subject for the Royal Commission on Aboriginal Peoples. Thus, he has been able to draw upon official sources unavailable to other researchers. Nevertheless, even he was forced to work within the restrictions imposed by the Privacy Act and departmental regulations. Milloy also chose not to include oral testimonies from former students of their experiences in residential schools because of his sensitivity to the impact of the process on the people involved. The author is certainly aware of the difficulty in attempting, as an outsider, to write about what Aboriginals have experienced on a personal level. He makes it very clear that A National Crime is an “operational history,” based primarily on the documents of the Department of Indian Affairs and Northern Development. Given his objectives, he has done an admirable job of tracing the birth, development and ultimate failure of the residential school system by letting the politicians, bureaucrats, and missionaries tell the story in their own words. Milloy quotes multiple government reports and correspondence from government and church officials that clearly indicate that the problems were recognized. Why then was nothing done? Milloy’s examples point to inadequate government funding as a major reason. Church leaders complained of their inability to maintain the buildings, hire qualified teachers, and clothe and feed their students. However, government responses indicate that the bureaucratic priority was saving money, not educating children or even saving lives. Nevertheless, in many cases the problem was not so much a lack of money, as simply bad management and neglect on the part of both the government and missionaries. Perhaps even more disturbing was the underlying assumption of Euro-Canadians, in the face of overwhelming evidence that residential schools were a failure, that they were a superior people who knew what was best for Aboriginal people. Even those Aboriginal leaders who initially favoured acculturation, as a form of survival, had little or no input into the operation of the schools. Church and government officials alike ignored Aboriginal students and parents who began to speak out about conditions in residential schools. 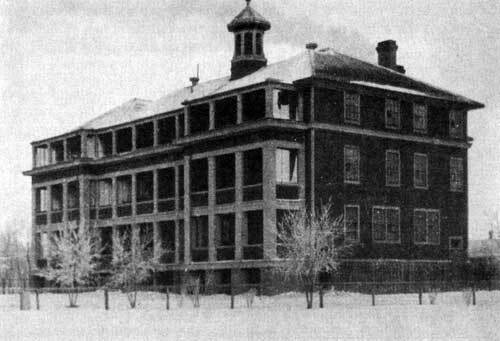 McKay Residential School at The Pas, circa 1923. Milloy’s A National Crime invites comparison with another recent history of the residential school system, J. R. Miller’s Shingwauk’s Vision, published in 1996. Both authors are respected Canadian historians who have written extensively on Aboriginal history. Both make substantial contributions to a subject that has remained closed for far too long. Milloy’s emphasis, however, is primarily on the role of the Department of Indian Affairs, whereas Miller, in his work, takes into account the role of the federal government, the churches, and Aboriginal leaders. He is less concerned than Milloy about appropriation, though he is equally respectful of Aboriginal culture. Miller is also more willing to try and answer the question: “Why did it happen?” For this he must be given full credit, given the strong feelings of everyone involved. A National Crime would have been a stronger book if Milloy had been more forthcoming in his own conclusions. However, Milloy does a more thorough job of describing the government’s educational strategies that provided the framework for the residential school system. He is also more thorough in documenting the appalling health conditions in the schools, and the indifference of the department, particularly under the regime of Deputy Minister, Duncan Campbell Scott. In these and other instances, Milloy’s and Miller’s approaches generally complement each other. Given the long silence that has shrouded this chapter in Canadian history, we can only be thankful that the story is finally being brought to light. A National Crime is not an easy book to read, given its subject matter. Many Euro-Canadians may well believe that this book unfairly maligns the sincere desire of many people to help Aboriginal children. Whatever the intentions of those involved, the facts that Milloy has marshaled leave little doubt that the residential school system was at best a tragic failure and at worst a national crime.